Blue light is a type of high-energy visible light spectrum due to its short wavelength of between 400−495 nm. Various studies show that the elongated exposure to blue light cast by bright screens of the computers, mobile devices and TVs during the evening may disrupt circadian rhythm and impact health, such as disrupting the normal sleep schedules and reducing the ability to fall asleep fast. The reason for the blue light to affect health is believed to be caused by blue-light-sensitive intrinsically photosensitive retinal ganglion cells suppressing the production of melatonin and/or stimulating the suprachiasmatic nucleus of the hypothalamus. Thus, the blue light fools the brain into believing that it’s day time, disturbing the circadian rhythm. Reducing the blue light emitting from the screen has been gaining steam lately. If you’re using iPhone, iPad or other iOS devices, you probably familiar with Night Shift, which automatically shifts the colors of the display to warmer end of the color spectrum after dark. 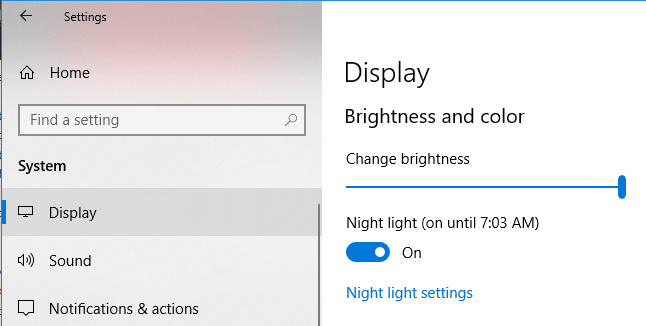 Now, Windows 10 also has built-in ability to remove the blueness from the monitor screen, and the feature is called Night Light. 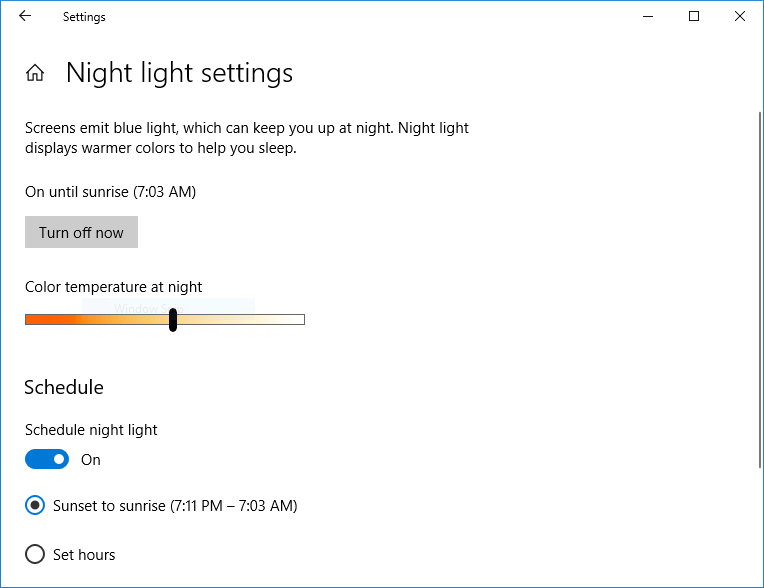 Click or tap on Night light settings to adjust the color temperature and schedule effective hours for automatic Night Light activation.